How would you describe a dangerous wave? Does it have to enormous in size, sink ships, swallow entire cities or simply rise about 70 feet and produce a frightening roar? Adventurous surfers have changed the way people think of waves by riding them with just a board and fins on one side of it. They risk serious injury and even death, but they also become legends due to their bravery, persistency and skills. You need all three to even think of attempting to get in the water where some of the breaks on the following list can develop. You may not know, for example, that surfers usually paddle in but they often need to be towed by jet skis into waves when it comes to big wave surfing. They hold on tightly to the umbilical rope; and as the wave builds, they release their hold and the jet-ski disappears, leaving the surfer alone in the oceans deadly waves. 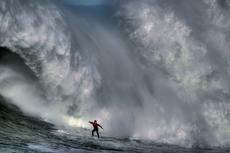 There are several surf spots in the world that, due to its size and pure power, scare even the boldest of surfers.